Research in Educational Psychology is concerned with the study of the cognitive, motivational, affective, and social learning processes that underlie education and human development across the lifespan. In our research we currently focus on four areas: interest development and the career choices of adolescent boys and girls; teacher education research, especially in STEM (science-, technology-, engineering-, and math-) related fields; the development of social forms of aggression, in particular the factors revolving around cyberbullying; and the psychosocial development of children and adolescents. The classes we offer are part of the pre-service teacher education program and the department’s research-oriented Master program “Educational Science – Organization and Counseling”. We provide training in the foundations of educational psychology and socialization, the practice of school psychology (evaluation and diagnostics), empirical research methods, as well as the processes of counseling, communication, teaching, and learning. 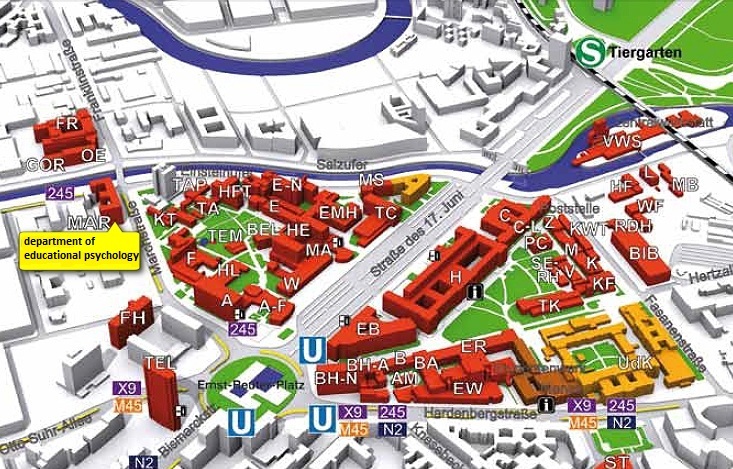 Our department is marked with a yellow box on the map.